I just had to squeeze in this last recipe before Easter (and Passover) in the hopes that some of you are still looking for inspiration! 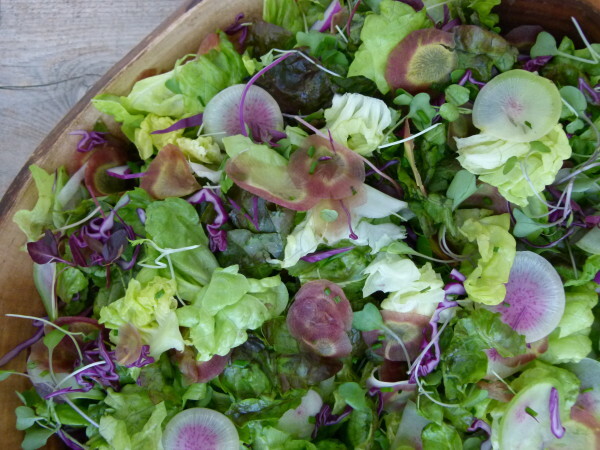 I taught this salad all last month in my classes and it was THE salad I seemed to make all the time last year when I had people over for dinner in the spring. 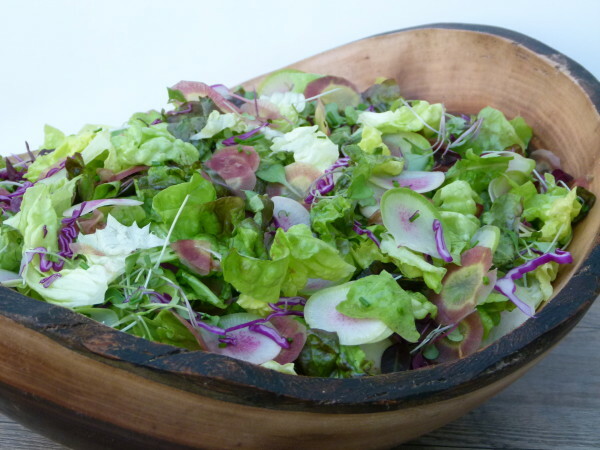 Spring is the operative word here since there is no mistaking in what season this salad lives. I mean just look at it! It is everything spring should be — bursting with lightness, color and a breath of fresh air! And full of veggies that come into being in the spring. Plus it’s beautiful and it will go perfectly with whatever you’re making. Leg of lamb, perfect. Baked ham? Perfect. Roast chicken or fish. Perfect. 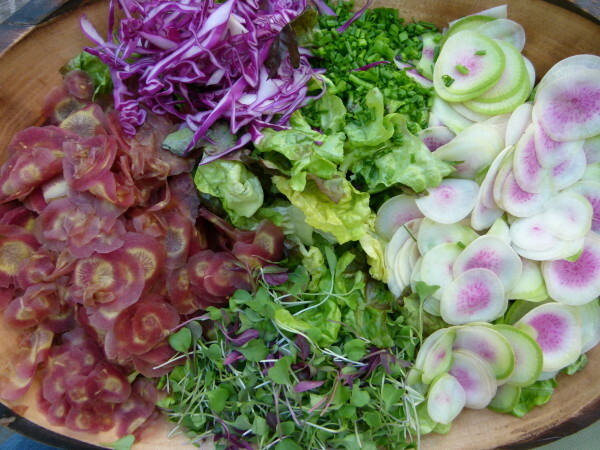 The key with this salad is the balance of textures and colors. 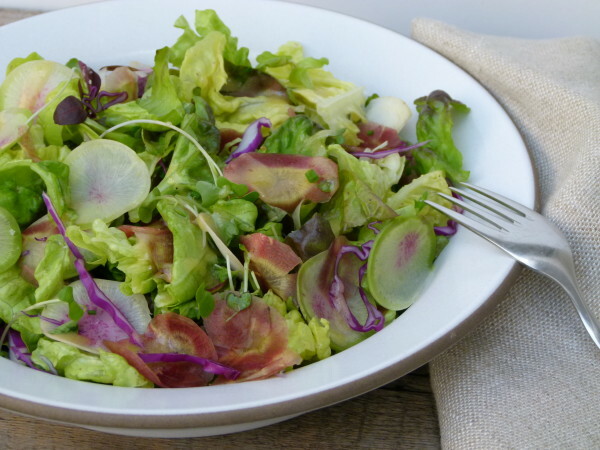 You want to keep everything somewhat delicate which is why I love Bibb or Butter lettuces. I found this beautiful red-leaf butter lettuce at my farmers market and used it for every class. But then you need to do your best to slice all the hard and crunchy stuff as thinly as you can, again to keep things light. I used my food processor to thinly slice the cabbage, carrots and radishes. If you have a 2mm or 1 mm slicing disc for your Cuisinart, I would use that. My new Breville has an adjustable slicing disc, so I turned it to just under 1 mm. I especially like bitter vegetables like radishes to be on the thin side. 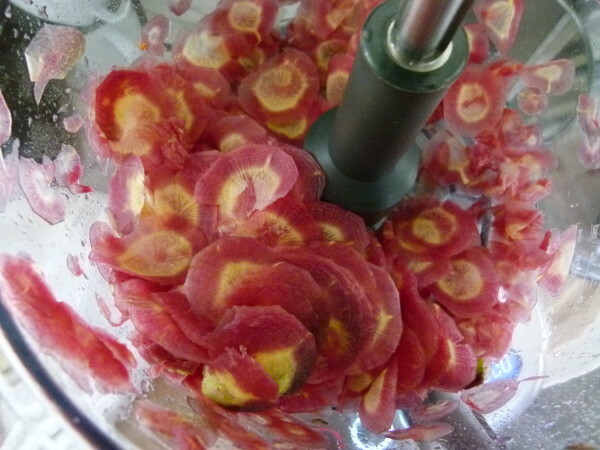 If you don’t have a food processor and your mandolin scares you (I don’t blame you), then just get out your sharpest knife and do your best. You can even do matchsticks for the radishes and grated carrots. See if you can find beautiful heirloom carrots in purple or yellow and watermelon radishes like the ones here which are so dramatic! I was able to find such carrots at my farmers market as well as Trader Joe’s. My Whole Foods has had these radishes for the last three weeks. Stunning! They will make you look so good. 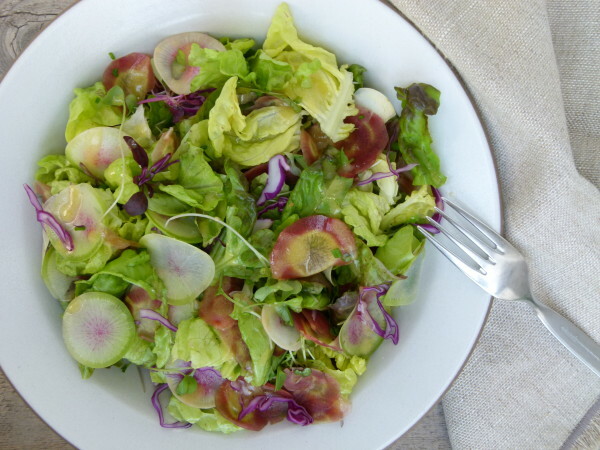 Your family and friends will be so impressed with whatever dish is graced with sliced watermelon radishes! Truth be told however, my favorite component of this salad is the fresh chives. Light, grassy with a very mild onion flavor, chives are like the most delicate green onions. I just love them in this salad and others, too. You know how much I enjoy shallots in my salad dressings, but I don’t add them here because the shallots offer enough of that flavor. Even if you don’t make this recipe, consider adding chopped fresh chives to your next salad. I know you won’t be disappointed! You can do so much with this salad including adding feta, mint leaves, walnuts, avocado, oranges or kumquats. There’s plenty of dressing for you to add in any of these. Speaking of dressing, since there’s nothing in this one that can spoil, feel free to make this well in advance. I’m sure it would do just fine in the fridge for 2 weeks. It will firm up though because of the olive oil, so remember to pull it out of the fridge at least 20 minutes before you wish to serve it. Place the butter lettuce in a large bowl and layer the remaining ingredients on top. Place all the ingredients for the dressing in a bowl or screw top jar and whisk or shake to combine. Drizzle just enough dressing to coat lightly and toss together. Finish with a sprinkle of flaky sea, if desired. 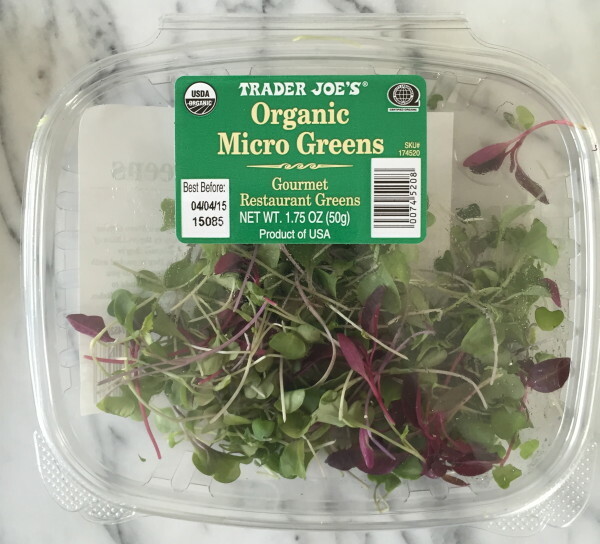 As soon as I published this, I knew I should have included a photo of micro greens. As soon as I have some daylight tomorrow, I will photograph and add an image. They are basically the beginning stages of a plant. 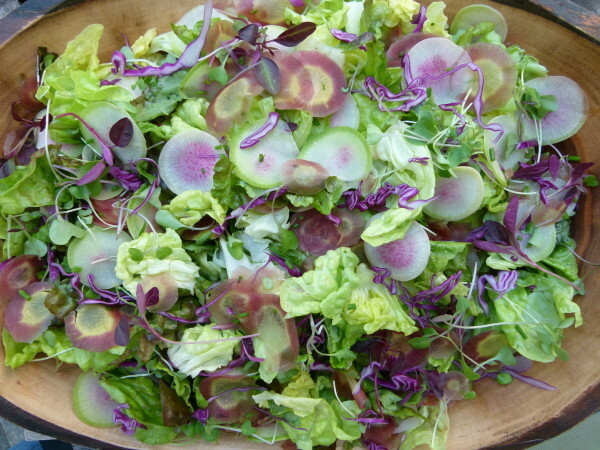 You can find different types of micro greens — kale, radish, broccoli, mixed greens. They are very delicate and look lovely in a salad. They are actually quite nutritious as well. Stand by for that picture! thanks!! i decided to stick with Passover protocol ;). have a good holiday. I have called whole foods, trader joes, balduccis, and a bunch of specialty produce places in my area. 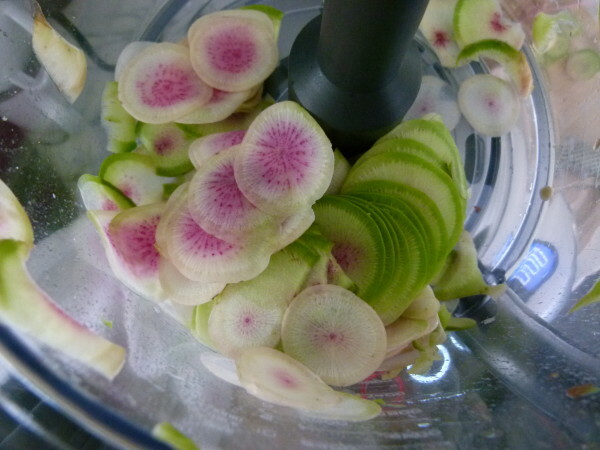 I am convinced the watermelon radishes are a west coast thing. Is it just not the season for them here yet? Buggers. I am not sure if they’re just a West Coast thing. But it is high radish season, so if you don’t see them now, I doubt you will. The salad is still lovely without the watermelon radishes though. Can you find purple radishes? Even if you can only find red ones, again still lovely!